Twenty 23 burger tourists descended on Hamburger Hamlet. The place was huge - for a change everyone got to sit at one long table. 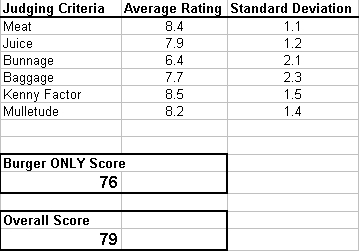 Overall there were strong scores for meat, baggage, and especially for Kenny Factor. The weak bunnage seemed to be the main drawback for the hamlet. There were some new faces and a total of 22 tourists. A few deviations from the burger tour mission statement occurred when chicken, turkey, and vegetarian meals were ordered. 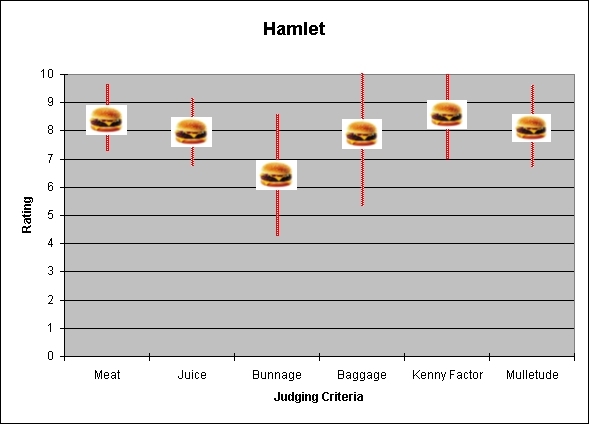 These votes were not counted for meat or juice. As we left some tourists talked about coming back to try other non-burger items on the menu. Worst BBQ sauce ever! It tastes like lemon pledgeTM.